Last week, Bank of England Governor Mark Carney said "some removal of monetary stimulus is likely to become necessary if the trade-off facing the MPC continues to lessen". The BoE takes an optimistic stance on wages, attributing much of the recent downward lurch in annual growth to temporary factors (apprenticeship levy, pension changes). But with firms’ cost bases rising given higher import prices, Brexit uncertainty persisting and the outlook for consumers deteriorating, we think firms may be increasingly less willing to boost pay – at least not to the extent of the BoE’s forecasts. Given the intensifying household income squeeze, Governor Carney has said that a pick-up in investment is essential if the Bank were to raise rates. Here, the latest evidence is not encouraging. This week saw a trio of disappointing PMI readings, in which service sector firms were the “least upbeat” about growth prospects since the immediate aftermath of the Brexit referendum. Firms cited heightened uncertainty and “Brexit-related risk aversion” as causing a slowdown in new work. Given the degree of uncertainty surrounding Brexit, and now the UK political climate, we think investment is likely to remain subdued in the short/medium-term, making it less likely that the BoE’s growth-inflation “trade-off” will tilt in favour of tighter policy. At 10.3% YoY, consumer credit growth has been rising significantly faster than incomes and is a key reason why, until recently, consumption has stayed resilient. Last week, Carney noted the importance of seeing “how the economy reacts” to tighter policy – and here the rise of unsecured lending is a potential risk when raising rates, particularly given the already fragile consumer spending outlook. The Bank is already taking this issue very seriously, as demonstrated by the Financial Policy Committee’s decision to raise capital buffers last week. But if the Bank does decide to raise rates in the near future, this argument makes a “one-and-done” hike more likely than a more sustained hiking cycle. For the reasons discussed above, we still think a rate hike this year looks unlikely, although the risks are clearly rising. For now, we think the latest rhetoric is predominantly designed to get markets entertaining the possibility of tighter policy, rather than an explicit hike signal. But if the BoE were to vote for a rate rise, we think this is more likely to involve the removal of last August’s emergency stimulus, rather than mark the start of a sustained tightening cycle. 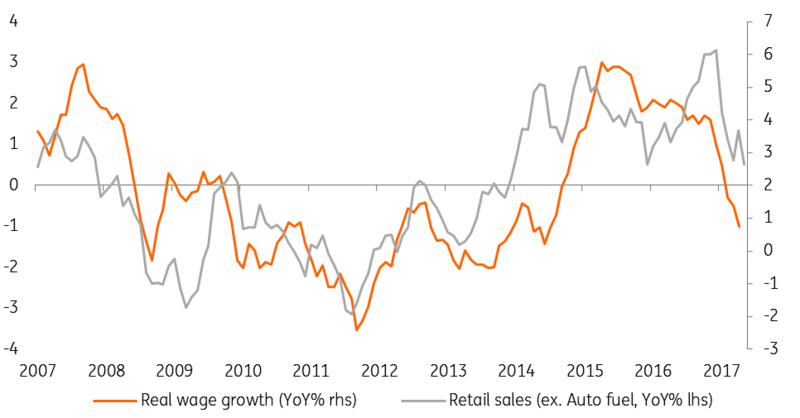 UK growth data: The final nail in the May rate hike coffin?